Summer is officially 26 days away! Aka, you’re wanting your clothes to fit nicely and you want to feel good in them, right? If you’re stressing about your weight at the moment, I want to share a few reasons why no matter what your greatest efforts are, nothing is changing. Sometimes it’s the littlest of things that can have a huge impact. I tell you this one from experience because working from home makes it easy to be a mindless snacker, what with the kitchen a few steps away. I have three pieces of advice for you on this one. Don’t buy the food in the first place that might be tempting – chips / cookies, or whatever your temptation is. If it’s already in the pantry, take it to the food bank and get it out of your house. Keep track of what you’re eating (for a few days). It can become obsessive to do it long term, and create an unhealthy relationship with food, but for a few days it can be very eye opening on just the quantity you’re eating. Schedule in snack time once in the morning and once in the afternoon, vs grazing all day long. It’s not to say that snacking in general is bad. If you’re hungry, you should eat. By scheduling a snack in at 10 a.m. and 3:30 p.m., for example, you have permission to have a snack, but just one between each meal. When you’re constantly eating/grazing, it can keep your insulin levels elevated all day long, which makes it tough to lose weight. It can be tempting to replace your sugary foods with artificially sweetened ones to keep that sweet taste, but in one study, those given Sucralose as as sweetener resulted in a 20% increase in blood glucose levels. It’s not completely understood as to why this happens, but it’s thought that part of the body’s blood sugar response is psychological, and based on taste. What that means is that even if you’re not actually consuming sugar per se, the artificial sweetener may make your body think it is, instigating an insulin response (and chronic insulin responses can cause weight gain). While switching up a low calorie breakfast with one with added protein might seem counterintuitive to weight-loss, it isn’t. In order to lose weight, you have to balance your blood sugar with protein. This is probably the most important point in this post. Genuine Health recently launched a Fermented Greek Yogurt Proteins+, so I thought I’d share a high protein recipe for you that would be perfect to start your day with. You could also do a 1/2 portion as an afternoon snack. 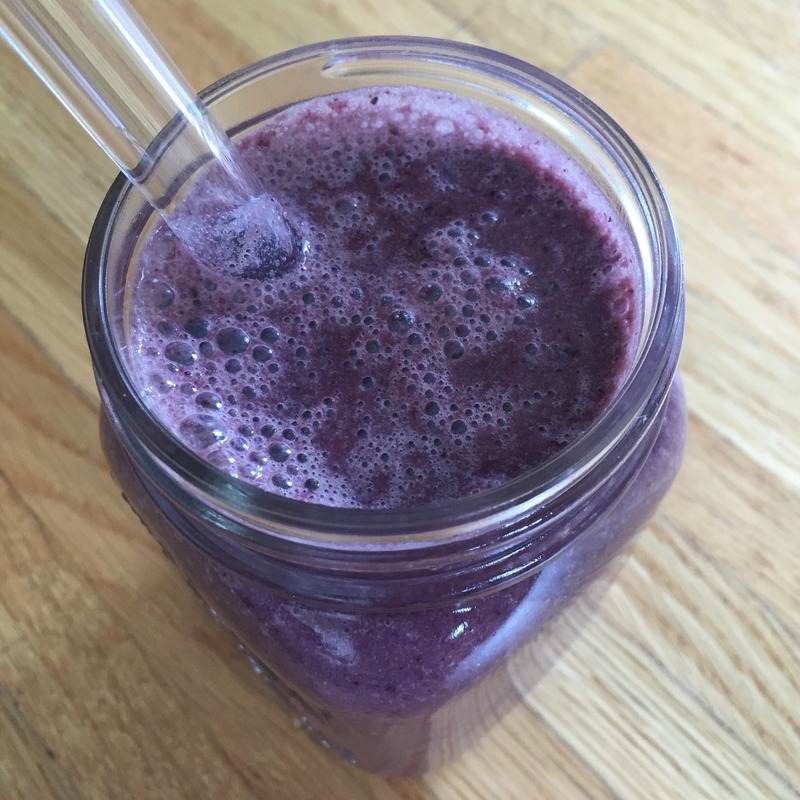 Click here for a delicious, high-protein smoothie recipe! Given that the protein is fermented, it’s more digestible and the nutrients are more available to your body! Why does this matter for weight? Well, in addition to protein being important to balance blood sugar, studies have shown our intestinal bacteria can also play a role in our weight. This protein is kind of like a 2 in 1: absorbable, quality protein + benefits for your gut health. Now, this is a dairy product, and I don’t always recommend dairy based foods, but this one is grass fed (WIN! ), and again, because it’s fermented, a lot easier to digest. A couple of months ago, I did a 4 week stint sugar free. Like, completely sugar free – not even maple syrup, honey or dates, but definitely no cane sugar of any kind. Here’s the crazy thing: I already thought I ate relatively sugar free, and I realized there was still little bits of sugar creeping in to my diet. Now, does a tiny bit of sugar matter? Likely not if it is truly a tiny bit, but similarly to the mindless snacking, it’s easy to forget the other “little” bits you already had that day, combined with the fact that a “little” bit can very quickly have you craving a lot more. From time to time, eating out is awesome, and so fun, and I think it should be enjoyed. When it’s multiple times a week though, it’s a huge hinderance to your weight loss efforts. Not only are the portions larger, but you don’t really know what exactly is in the meal – i.e. was it drenched in an oil you wouldn’t typically eat if you were cooking at home? If you are going to eat out, here are my top restaurant choices for Toronto & Vancouver. Otherwise, if you’re struggling in terms of what to cook, check out my Weekly Meal Planning program. If your cortisol levels are too high or too low, this is proven to impact your weight as well, and can make it feel like NOTHING you are doing is working (no matter how well you eat). Sounds a bit odd, as you might not have heard of cortisol before. Cortisol is a stress hormone, that in normal amounts is beneficial to your body. Insert a chronic stressor into your life and your cortisol levels become elevated (in the short term) and too low (in the longer term), and that creates a problem. This leads to chronically elevated insulin and glucose in the body, and excess glucose is stored as fat. Step one is to practice some stress reducing techniques, but what can be really useful is to actually test your cortisol levels through a saliva test. Click here to get in touch with me to learn more about how balancing your cortisol can help with weight-loss. Remember that when it comes to weight, it’s more than JUST what you eat. Hormones can play a tricky role in weight-loss. If you’d like to chat more about your weight, please click here and book a time to chat with me, at no charge.